Bill's Movie News and Reviews: National Geographic: "Journey to the Edge of the Universe"
National Geographic: "Journey to the Edge of the Universe"
Baldwin starts at home on earth, takes us to Luna (the Moon), where a dozen men have walked in person, then to Venus, with a view of Dante’s inferno and an atmosphere of carbon dioxide and sulfuric acid clouds – earth’s future, maybe. He moves to Mercury, which he says may be the iron core remnant of a larger planet after a cosmic pinball accident, and then the Sun itself. Then he moves out, with spectacular animated simulations of Mars based on NASA photos, then Jupiter, with the volcanic moon Io, and the iceball Europa, which could have life in its tidal ocean. 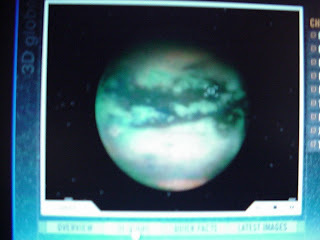 The film shows some pretty interesting animations of what Titan may look like, with its ethane lakes – it’s probably darker than this. We might settle Titan (rather than Mars) in a couple billion years when the Sun has become a red giant, frying earth, and Titan is warm enough. He moves on to Neptune and the curiously scenic moon Triton, with its nitrogen geysers. He moves out through the solar system and Oort cloud, to the nearest star, and into the Milky Way. He offers evidence of a star 20 light years away with an earth-like planet that could be watching our TV shows from late in the Reagan years. (If it has a civilization like ours with trade and fiat money, you can safely assume that it has business depressions just like we do.) He explores other wonders of the galaxy, including the Crab nebula, with no wind, white dwarfs, neutron stars, and finally black holes, which could roam around unseen dangerously close at any time. He mentions the possibility of the “hypernova”. Baldwin’s narration offers some other speculative ideas: that life itself is viral, seeding itself from one place to the next. When he talks about black holes, he suggests that they invoke the edge of human understanding, and that our universe might reside inside a black hole in a parallel universe. He goes into deep space, past other galaxies, a few billion light years where galaxies as we see them are younger. He talks about dark matter, which could hold much of the universe together. Finally he comes to a quasar, the largest and most violent object in the known universe, powered by a super massive black hole. In the end, our whole world is the merest speck compared to the enormous, impersonal universe. Now to come to the reason I put this on my movies blog and not the TV blog: One point for me was that a film like this really should have a theatrical release, and be shown on large screens, especially to see planetary surfaces. Imax has given us a look at the Moon (“Magnificent Desolation”) and Mars (“Roving Mars”). But wouldn’t it be wonderful it NatGeo could get together with some other companies like Pixar or HDNET/Magnolia and make a commercial theatrical release (maybe Imax 3-D) showing us what Titan, Europa, Triton, and other less commonly explored objects really look like up close. For Titan we have a lot of photos from Huygens-Cassini. Even in this economy, this could be a fresh direction for Hollywood to go in. NatGeoTv preceded the film with a one hour “Naked Science: Deadly Planets” that explored some of the Solar System for possible future abodes. For Mars, the show explained how dust devils (little tornadoes) coalesce to form a planetary dust storm. The same thing happens on Earth over wide areas, like the Sahara. The show gave a fascinating view of Triton, but curiously skipped both Europa and Titan. All of the earth-like bodies and gas giants in the Solar System, besides Earth itself, are deadly, although Mars has a chance. The biggest problem for Mars might be the loss of its magnetic field (see NASA discussion). Back in 1998, there were two big films that simulated what Mars could look like: "Mission to Mars" (Disney) and "Red Planet" (Warner Brothers), the second of which, as I recall, presented a vision of terraforming Mars. Titan would be even more challenging. Visitors will want to browse NASA's "Cassini-Huygens Home" from the 2005 flyover and landing on Titan, here. There is a British version of the film narrated by Sean Pertwee (wikipedia) here. It seems as though it is the same video and same text with a different narrator. I've never seen this done before. The director is Yavar Abbas. The British version is release by Pioneer Productions UK and, oddly, is shown in 2.35:1. The director (both versions) is Yavar Abbas. The new YouTube video of the British version is dated 2013. Viewers may want to look at “Titan: A Place Like Home” (BBC), TV blog on Sept. 20, 2013, and “Evacuate Earth” (NatGeo), on my “CF” blog , Aug. 20, 2013. The best films I’ve seen that speculate on advanced alien life are “Alien Planet”, Discovery, TV blog, May 4, 2012, and NatGeo’s “Extraterrestrials” (50 min, 2005), International Issues blog, April 25, 2007 (an odd place to review it, I admit). And Alec Balwin seems to have narrated a NatGeo documentary by the same title (Dec 8, 2008 here) as this film.